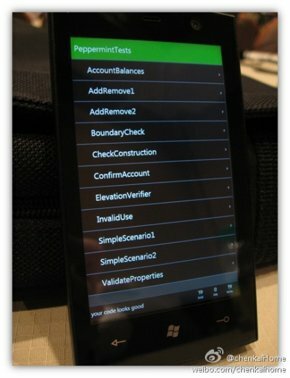 Images of a new href=”http://www.windowsphone7.com/” rel=”homepage” target=”_blank” title=”Windows Phone 7″>Windows Phone device from href=”http://www.lg.com/” rel=”homepage” target=”_blank” title=”LG Corp.”>LG have recently surfaced on the internet, hinting that LG could possibly have a new Windows Phone device in the works. The phone doesn’t have a name attached to it at the moment, but it is labeled “LG’s engineering machine, etc. when you can see at href=”http://www.cesweb.org/” rel=”homepage” target=”_blank” title=”Consumer Electronics Show”>CES. Not for sale.” Chances are the device is a leaked prototype that may or may not be released as a consumer product. The phone looks like it has has a pretty large display, but then again it’s hard to tell seeing how there’s nothing to compare it with. But it might be making an appearance at CES, so if we do get our hands on it, we’ll let you know how well it stacks up against the latest Windows Phone offerings from href=”http://nokia.com/” rel=”homepage” target=”_blank” title=”Nokia”>Nokia (Lumia 800 and Lumia 710). Previous articleGoogle Nexus Tablet to have a 7″ display?